Little Road to Bethlehem | "Northern Crossings"
This time of the year our thoughts turn often to that journey from Nazareth to Bethlehem and the hardships that must have been involved. 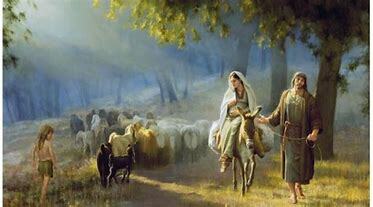 I love this painting of Mary and Joseph passing a shepherd and his sheep as they make the journey. There is a simple song that imagines the shepherds and the sheep after the birth but while Mary and the baby are still in the stable. I heard it long ago on one of those Disney concerts. The song itself was remarkable because it was just a women with a guitar on the stage singing. We don’t see that much anymore. There has to be smoke and lasers and explosions and dancers and wardrobe malfunctions for us to be entertained anymore. A women on a stage with a guitar is unusual. The song was simple and the situation was strange because I heard only the phrase ‘along the little road to Bethlehem” and the guitar. I would come home in the evening and the replay of the concert was on and I would come in at just the same time and see the same thing. It took awhile to find the whole song, but just a moment to fall in love with it. It was written by a man named Michael Head who was well known for writing music and playing concerts at factories in Britain while the Nazi’s were bombing. He wrote the music for words written by Margaret Rose who was inspired by sheep in Essex who were following a bell sheep home in the evening. It is simple and beautiful with the juxtaposition of sheep passing by the resting place for the “Lamb of God who takes away the sins of the world” and Mother Mary cooing to him and calling him her “little King”. From the Rising of the Sun to Its Setting………….